Bijan Bar Restaurant is throwing an early Merdeka party and everyone’s invited! 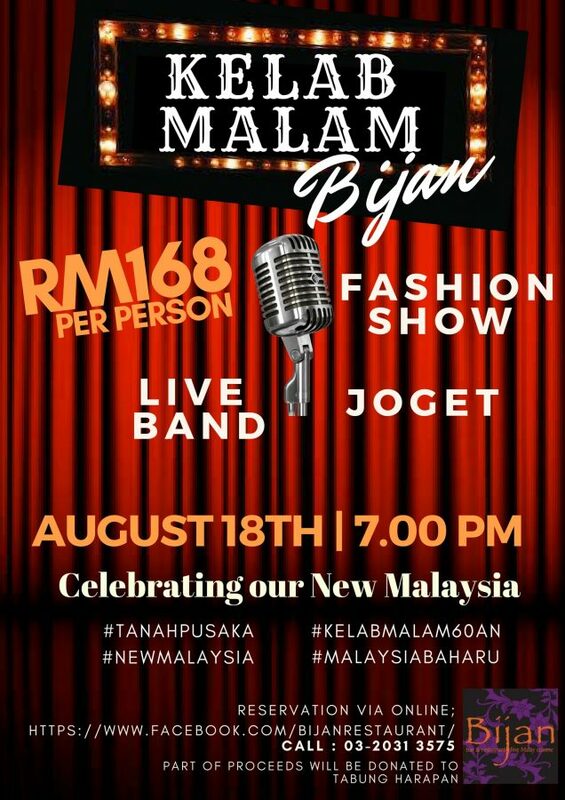 The Kelab Malam Bijan party will be an evening to reminisce the golden era of the sixties via performances by local artists from the arts, music, and fashion industry. Guests can look forward to a fun night of music, dancing, fashion, and food. Think ‘joget’ or ‘ronggeng’ with cabaret girls, alongside delicious Malay food and accompanying wines. Chef Syawal has created a menu to showcase the Malaysian heritage filled with unique, rich, and colourful flavours that transcends the decades. From colonial influences of the 50s to classic home-cooked favourites, there will be a variety of modern and traditional dishes. Guests are encouraged to dress up in fashion from their favourite era. A portion of proceeds will be donated to Tabung Harapan.